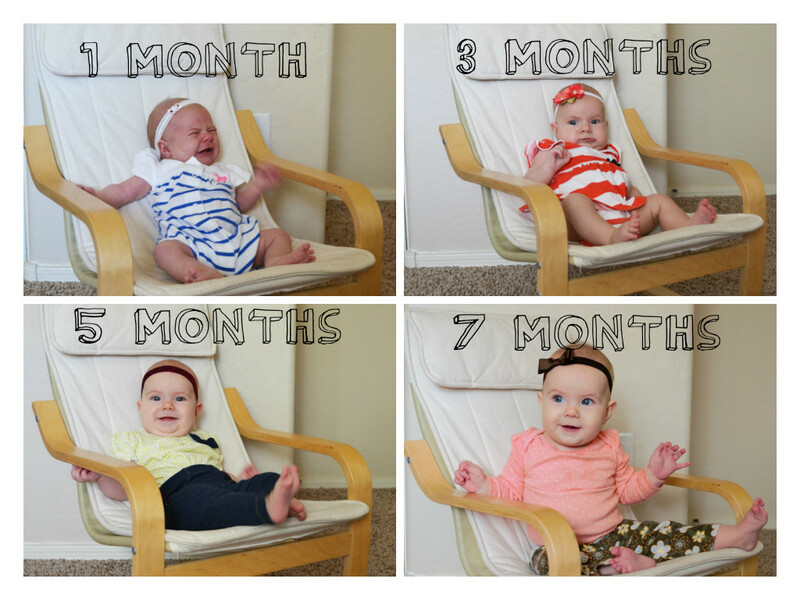 Mom, the Intern: It's great to be eight (months)! It's great to be eight (months)! Yeah, WHAT?! How is this even possible? I feel like shedding a tear over it. But, I probably won't shed an actual tear because watching your baby grow up is fun, too. Clara is now crawling everywhere, which means the permanent baby gates have been installed on the stairs and in front of our doorless master bathroom. She is also eating adult foods on a regular basis, and despite not having any teeth (STILL!!!! ), she really prefers whole foods over purees. Well, I'm not thrilled about the prospect of giving my child the Heimlich maneuver so I hope those teeth come in soon. In the meantime, I'm just mashing and chopping everything I give her. She still nurses every three hours or so. It's been about 4 years since I last had a nursing baby and I forget when they start to drop their day feedings. Any hints on this? It seems a bit overkill to be nursing her so often still. We've had a rough month with teething and both an ear and upper respiratory infection, so Clara got a little off-track with her sleeping. I hate to see my babies suffer! I wish it wasn't possible for the wee ones to get sick. But with a brother in preschool and a sister in 2nd grade, we pretty much have to expect it. I took her to the PA at the pediatrician's office and he said she is 16.5 pounds. Besides the sickness, she seems to be doing very well, he told me. He also said we should bring her over to his house anytime to be babysat because she's so dang cute. Haha, I wonder if he says that to everyone. Christmas with Clara was so much fun! She basically chewed on all the gift bows while the kids unwrapped their presents. She was very happy to be the honorary bow-eater. She got some cute jammies, a quiet book for church, clothes, cereal puffs and a few chew toys. Oh, and a sippy cup! She's figuring out how to drink from it and it's funny. She seems so tiny still so it cracks me up to see her do big kid stuff already. Clara is a real doll and everyone who sees her in public lights up. She has huge, expressive eyes and is always smiling. What's not to love? She is adorable, cuddly and fun. And VERY curious! She gets into everything just like her siblings before her. She's going to be exceptionally smart just like them, I can tell. She's growing up so much!! Such a cutie! Thanks for sharing!